COMPETITION: Win Tomoyasu Hotei Tickets! 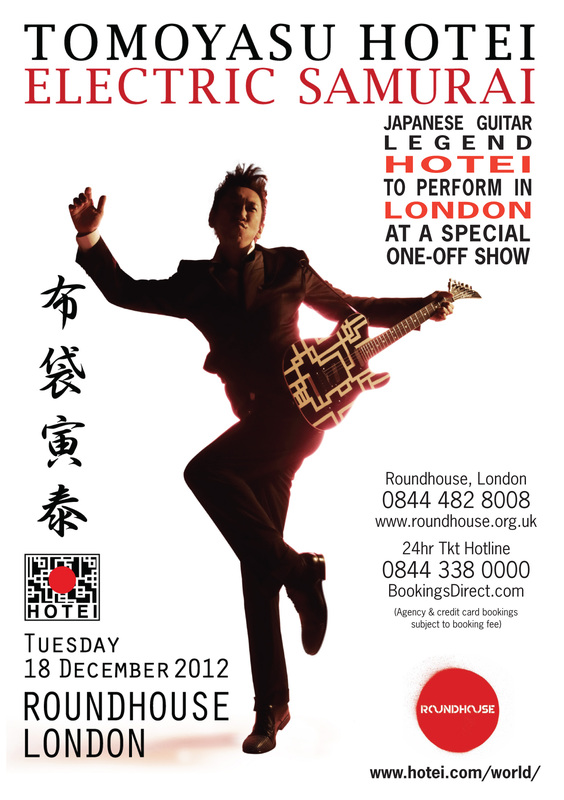 Japan Centre has teamed up with 3A Entertainment to offer one lucky winner a pair of tickets to see Japanese rock guitar legend Tomoyasu Hotei (Kill Bill and Fear and Loathing in Las Vegas soundtracks) in a special one-off show at the Roundhouse, Camden on Tuesday 18th December 2012, doors 7pm. Acclaimed Japanese guitarist, singer-songwriter, composer, record producer and actor, Hotei has received worldwide recognition for his work on film scores, most notably for the film soundtracks “Fear and Loathing in Las Vegas” (1996) and his song “Battle Without Honor Or Humanity” which was featured as the main theme of the film “Kill Bill” (2003). Hotei began as a guitarist in the legendary rock band, BOØWY and has collaborated both in the studio and live on stage with many diverse international musicians including David Bowie, Jesus Jones, Sugue Sigue Sputnik, Hugh Cornwell, Asia, INXS, Joni Mitchell, Ray Cooper, David Sanborn and Chicago to name just a few. This prize is perfect for both music and Japanese pop-culture enthusiasts. To be in with a chance of winning two tickets, simply leave a comment on this blog post or our Facebook post telling us who’s your favourite Japanese singer or band. You can also tweet us @JapanCentre not forgetting the hashtag #hotei. We will choose a winner at random on Thursday November 29th. The winner must be able to attend the 18th December performance and cover any transport costs themselves. of course, i love BOOWY. we are waiting for their reorganization!! 7-5-3, Go! It’s Festival Time!